When building a house exterior sheathing plays a big part in the integrity of your house. 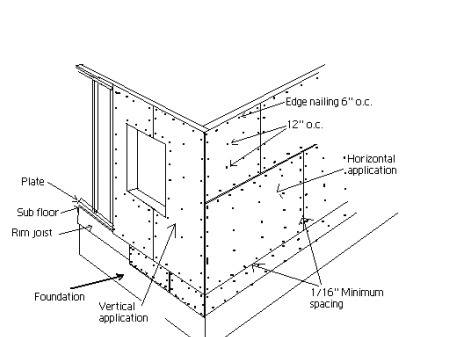 When a rigid sheathing, such as plywood or O.S.B. board is applied,it not only serves as a covering for the external walls but it also forms the bracing requirements for the framing of the house. 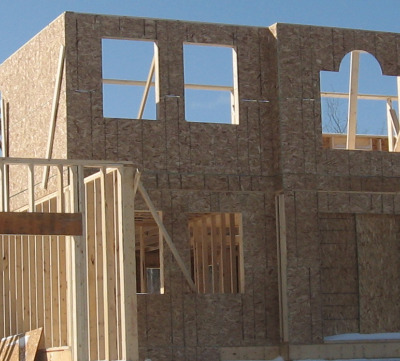 In today's market place you will find many types of exterior sheathing available such as lumber,fiberboard,gypsum board, plywood,and products made from styrofoam but O.S.B. (oriented strand board) being the one most often used when building a house. This illustration shows how to install O.S.B. or plywood sheathing. Plywood or O.S.B. panels can be applied horizontally or vertically. It is recommended that the panels be spaced a minimum of 1/16" apart. This will eliminate buckling of the panels if they expand. Nailing should be spaced at 6" on all edges and at 12" on center elsewhere on the panel. If 8' sheets are used,then a strip will have to be filled in either at the top or bottom as shown in the illustration. There is one point I would like to make. If OSB or plywood is applied vertical over the studs,then some sort of ventilation in the wall cavity should be supplied.I have noticed some contractors will put a saw cut between each stud in the out side sheathing.This allows moisture to escape from the wall cavity.This is a point that should be brought up with your building inspector. 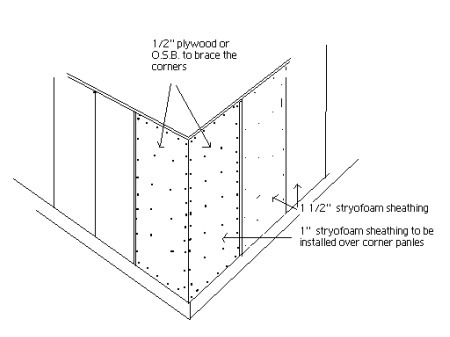 If using a non rigid exterior sheathing such as stryofoam it can be applied as shown in this illustration. By installing the more rigid plywood or O.S.B. in the corners the bracing requirements are met. Otherwise bracing would be installed when framing the walls. The illustration shows 1/2" plywood or O.S.B. applied in the corners and 1 1/2" styrofome sheathing applied on the rest of the wall. To keep the walls even, 1" styrofome is applied over the 1/2" corner panels. For more information on home building steps, follow the links below.